Recharge and refresh with your own homemade berry mint vitamin water. This is a guide about berry mint vitamin water. The only limit is your imagination when it comes to varieties of vitamin waters. Water is the one thing none of us drink enough of. Some people can't stand that water doesn't really have much of a taste. Water alone doesn't keep you hydrated. You need vitamins and minerals and electrolytes. This is a fun easy way to make a more healthy, fun, delicious way to drink more water. Many health issues can be traced to a lack of proper hydration. Did you know we are all supposed to drink half our body weight (in ounces) of water a day to be healthy? If you are 150 lbs, you should be drinking 75 oz. of water a day, or about 9 cups! So for the rest of us, that number might be higher! Proper hydration makes your skin glow and even helps with weight loss! NOTE: You can use fresh or frozen fruits. Fresh is great and usually tastes best but breaks down into the water a tad slower. If you need water and are in a hurry, use frozen fruit, as its cell walls are broken down from being frozen so it releases into the water much faster! Some veggies work well too! I recommend around 1/2-1 cup of fruit, depending on how strong you want the taste. Cut strawberries into small chunks. 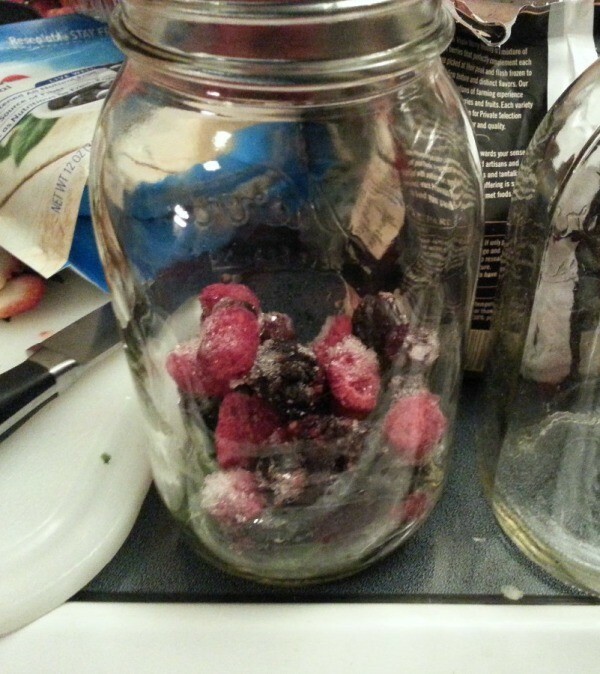 Toss blueberries in the jar whole. 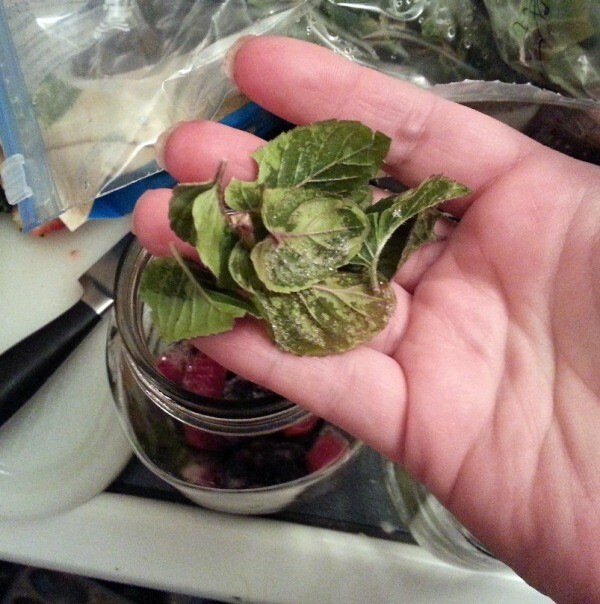 Add mint leaves. 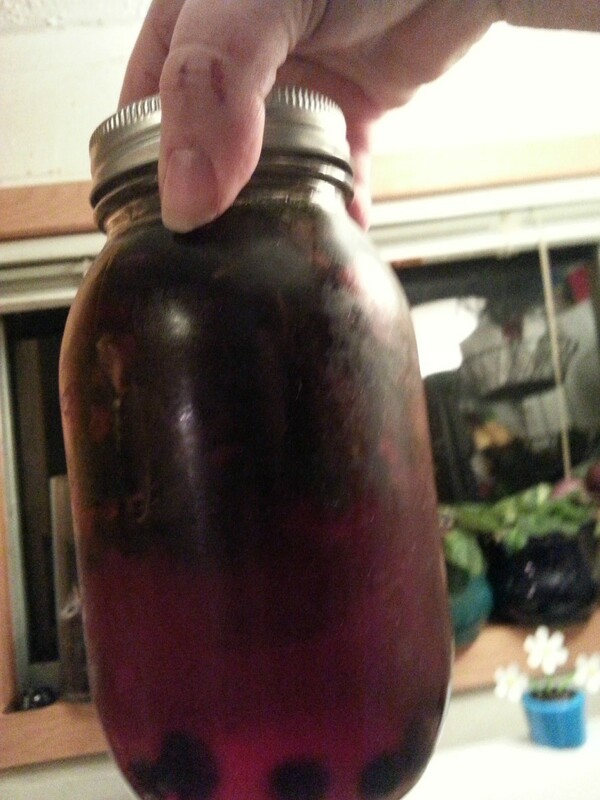 Pour about 1/2 cup water into jar. Using the muddler, crush the berries and mint a bit. Try to get most of the blueberries cracked open. You don't want to mash them into pulp, as it makes it harder to drink. Leaving some fruit less crushed allows you to make additional water later. Now fill the jar the rest of the way up with water. Screw on the lid and shake it a bit. Refrigerate and enjoy! Once you finish the jar of water, simply refill the jar, with the fruit still in there, and it's ready to go again! The waters last around 3-4 days before the fruit starts losing flavor and color. The less you crush the fruit, the more "refills" you can get. NOTE: When you are done with your water and the fruit is faded and losing flavor, toss the left over fruit in your compost bin! No waste!